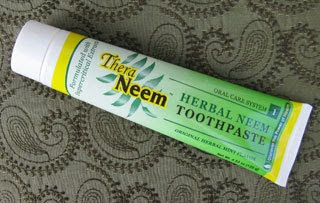 I've written about Neem before. But they've gone more mainstream since the first time I tried it. The tube of their new paste looks similar to the old, but the paste does live up to the "New" on the label (though funny enough, the old tube also had "New" on the label). This time, the paste is also green, but it's a little bluer in tint than the last yellow-khaki-green. 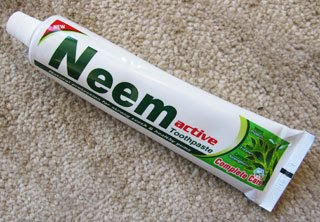 And it tastes much more like a traditional mint paste. "Active"? I'm not sure how it makes me more active. Maybe the fresh minty flavor leaves me wanting to be more active. I doubt it. 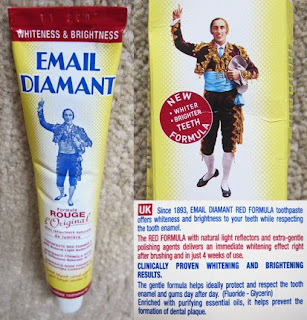 Special thanks to my sister Amy, the lady who started my journey into toothpastes (she bought it for me) - and also to my brother Bill, who mailed it to me.